The Campaign for Nuclear Disarmament (CND) is an organisation which advocates unilateral nuclear disarmament by the United Kingdom, international nuclear disarmament and tighter international arms regulation through agreements such as the Nuclear Non-Proliferation Treaty. It opposes military action that may result in the use of nuclear, chemical or biological weapons and the building of nuclear power stations in the UK. It was founded in November 1957 when a committee was formed, including Canon John Collins as chairman, Bertrand Russell as president and Peggy Duff as organising secretary. 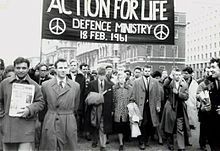 They organised CND's first public meeting on 17 February 1958. A symbol designed for them in February 1958 by Gerald Holtom, and first displayed in an Easter peace march to the Atomic Weapons Research Establishment at Aldermaston in Berkshire in April 1958, became one of the most widely recognized international peace symbols in the 1960s. Quotes of official publications and representatives of the CND. One of the most widely known symbols in the world, in Britain it is recognised as standing for nuclear disarmament – and in particular as the logo of the Campaign for Nuclear Disarmament (CND). In the United States and much of the rest of the world it is known more broadly as the peace symbol. It was designed in 1958 by Gerald Holtom, a professional designer and artist and a graduate of the Royal College of Arts. … The Direct Action Committee had already planned what was to be the first major anti-nuclear march, from London to Aldermaston, where British nuclear weapons were and still are manufactured. It was on that march, over the 1958 Easter weekend that the symbol first appeared in public. Five hundred cardboard lollipops on sticks were produced. Half were black on white and half white on green. Just as the church’s liturgical colours change over Easter, so the colours were to change, “from Winter to Spring, from Death to Life.” Black and white would be displayed on Good Friday and Saturday, green and white on Easter Sunday and Monday. The first badges were made by Eric Austin of Kensington CND using white clay with the symbol painted black. Again there was a conscious symbolism. They were distributed with a note explaining that in the event of a nuclear war, these fired pottery badges would be among the few human artifacts to survive the nuclear inferno. I don’t think the Campaign for Nuclear Disarmament has much chance of actually affecting the government. "Now More Than Ever tour"
This page was last edited on 31 March 2018, at 07:00.